This letter is long and hopefully it’s cohesive in its thoughts. When a blog gets too long, I worry about disconnected thoughts, more so than normal for me (ohhh look at the pretty bright shinny object . . . now what was I doing???). You can also leave comments for me at my chart link on StockCharts, “send feedback” in the upper right corner. International requests for Edson Gould files should make sure their email is transmitted properly. I received a request from Italy the other day and the return address was to their ISP and not to the individual. Needless to say, my response bounced back. Someone out there is probably disappointed that I didn’t respond. We’ll see if she is on her toes for this week’s blog. Incidentally, the end of the world isn’t until December 21, 2012, give or take 60 days (the Mayans didn’t keep good notes). So we have lots of time before we have to sell stocks and take our money (gold bars & guns) to the nearest cave. Doesn’t everyone know someone who believes these voodoo predictions??? I live in California and naturally there are lotsa nuts who believe this stuff. I do have a lot of fun needling the goof-balls. There are three datasets shown below, the datasets begin at different points in time; (1) beginning in 1950, (2) beginning in 1998, and (3) beginning in 2007. Each dataset begins in the named year and runs to the present. Each of the datasets has a short, intermediate and long term chart. On a long term basis there is little or no difference between the dataset cycles but short term cycles “may” have a different interpretation. We had such an occurrence take place in January 2012, where the shorter term dataset had a 16 week cycle bottom occurring in late January, while the older and longer dataset had the same cycle bottom occurring in late February. Now that we have passed the January bottom cyclic timezone, all of the datasets appear to agree that the bottom occurred on January 30th. It was a 16 week cycle low and these lows are normally more significant than January 30th. 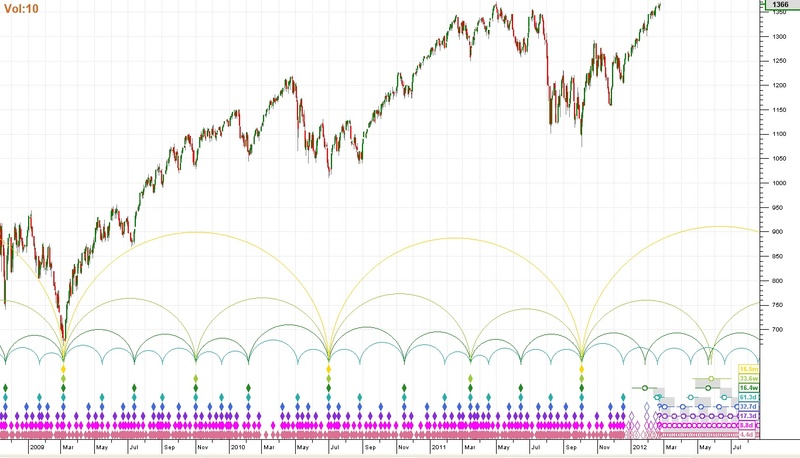 The next cycle low of significance is scheduled for May and it’s a 33 week low. That cyclic low is smaller than the October 4th low, which was a 16-18 month cyclic low. Nevertheless, the May cyclic low is long enough to be significant. Longer cycles are more powerful than shorter cycles, see “The Principle of Proportionality” below. May is also the date of an interesting Fibonacci time sequence. 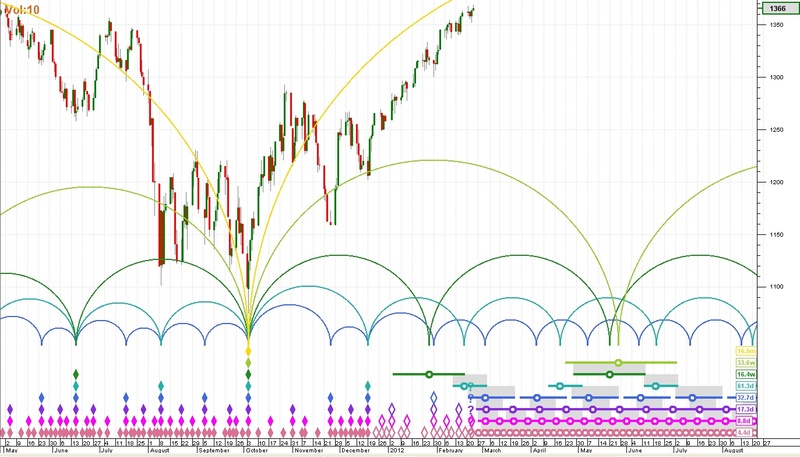 We have two Fibonacci arcs ending in May 2012. One arc originates from the October 2002 low and terminates on the October 2007 peak. The second arc originates from the October 2007 peak and terminates on the March 2009 low. 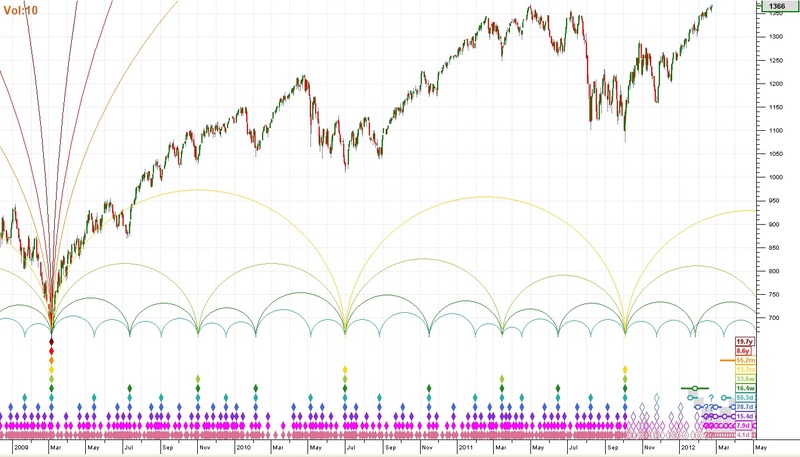 I have no idea if these arcs will be significant but I find them interesting due to their convergence and the anticipated cyclic low. 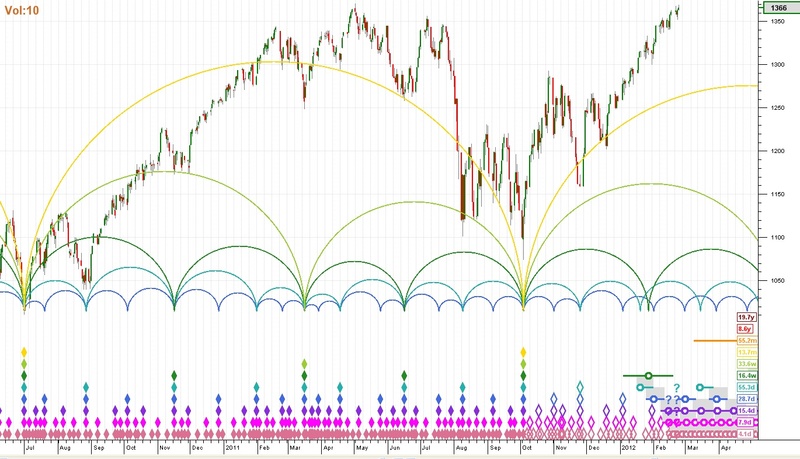 If you study some of the ending dates for the other arcs in the chart, you will see that some terminated near important market dates. If you want to get really spooked Wicked Laugh. Large step 1 up ended in May 2010 and large step 2 up ended in May 2011. That’s pretty freaky coincidence, right??? But will large step 3 up end in May 2012??? 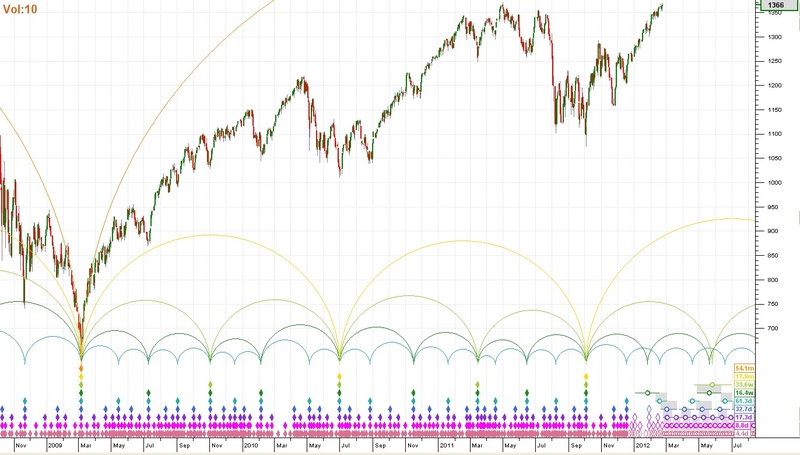 Hopefully not, because I have greater expectations for this bull market (megaphone formation) than what could be fulfilled by May 2012 (megaphone illustrated on the following chart). You aren’t going to see much difference in the dataset charts, unlike what happened in January. The Principle of Cyclicality – Price movements consist of a combination of specific waves and therefore exhibit cyclic characteristics. The Principle of Summation – Price waves which combine to produce the price movement do so by a process of simple addition. The Principle of Harmonicity – The wavelengths of neighboring waves in the collection of cycles contributing to price movement are related by a small integer value. The Principle of Proportionality – Waves in price movement have an amplitude that is proportional to their wavelength. The Principle of Nominality – A specific, nominal collection of harmonically related waves is common to all price movements. The Principle of Variation – The previous four principles represent strong tendencies, from which variation is to be expected. You can find further information about Hurst’s Cyclic Principles here. There is lotsa good Hurst info at that link and if you want up to the minute info on the Hurst Cycles, consider subscribing to their service at the following link, Hurst Signals. It’s a very good service and I am a subscriber too. 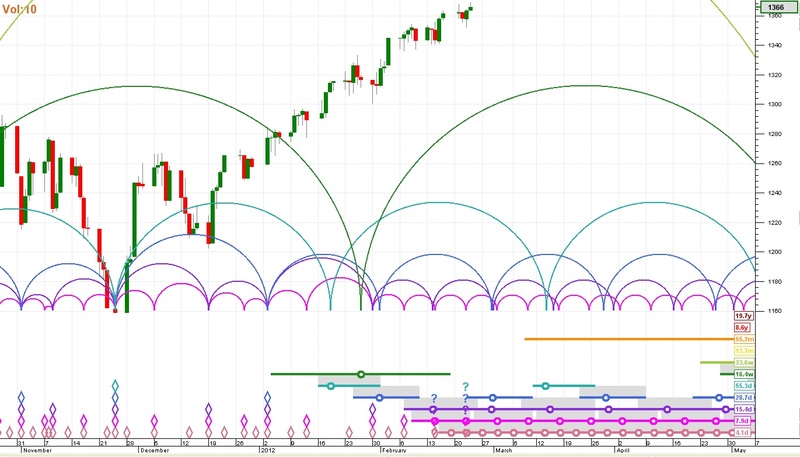 The software to generate the cycles is expensive but Hurst Signals is reasonable and the charts and comments are constantly updated throughout the market day. One reason why I subscribe to their service is that it can be accessed very quickly. For me I don’t have to update my data files and boot up Parallels, a Windows virtual OS running concurrent inside the Apple OS X. After Parallels is up I can then start the Hurst software. Once it’s operating on my Apple, it’s no problem. But as you can see there is some time and effort to running Windows software on an Apple. But Hurst Signals gives me the answers I need quickly and straight to the point and it’s cheaper. Hurst Signals operates inside your browser, hence the speed. This service has confirmed my thoughts on an approaching bottom on more than one occasion. 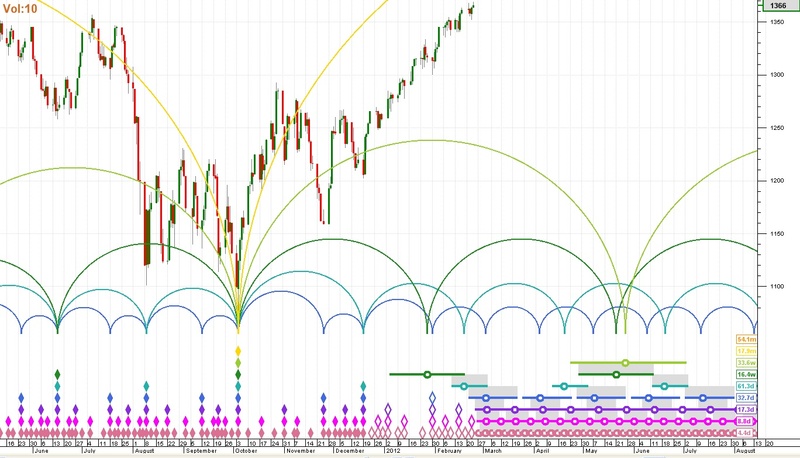 The software package for the intraday cycle charting and analysis is $2500 plus $375 per year maintenance, while the Hurst Signals subscription is $135 quarterly (less if you pay by the year). To make sure you don’t get the wrong idea later in this update, I remain in an “overall” uptrend theme as per previous updates. That means zig-zag not a straight line up. It’s possible that we could have a correction at any point but it’s likely not a significant exit point in the stock market. Investors should stand pat and traders should be careful about what tactics they use. We have been experiencing a bull market buying stampede and typically you don’t want to get in the way or left behind. Therefore careful tactics must be used. I would consider this update a situation advisory but not a tactical advisory. It might be wise to re-read the section of the Glossary entitled “Money Management”, it can show a possible tactic on how to remain in a long term position but also take short term profits along the way. The example used is for futures contracts but you could divide contemplated stock positions in thirds and proceed in a similar manner. 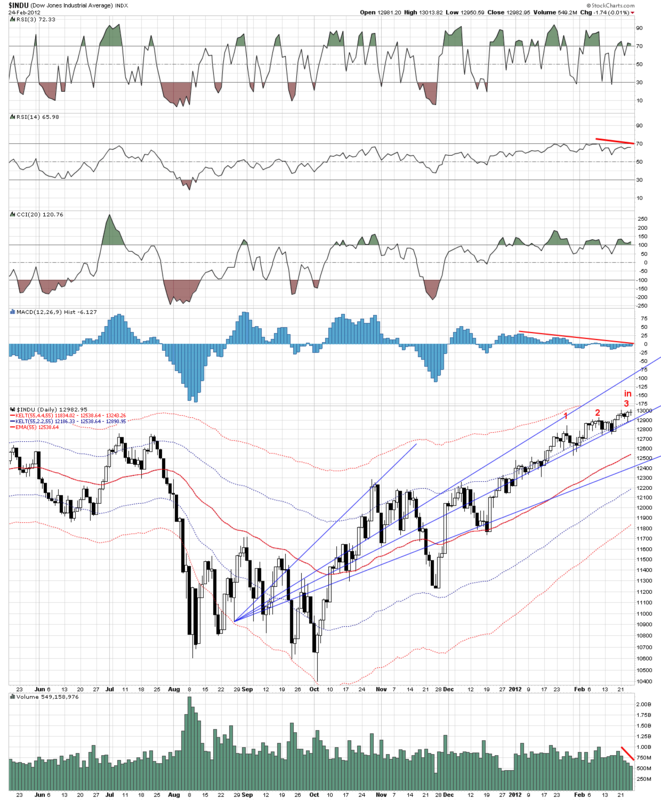 We have several divergences showing up in various indexes. 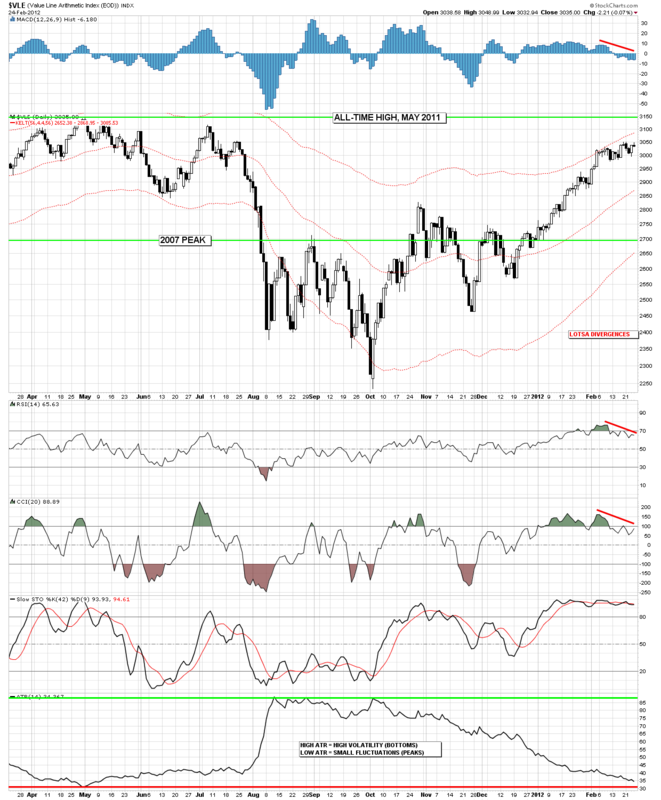 From past experience we know that divergences can go for several months. IF we aren’t extending the wave count we should be in the 3rd step up that began on Dec 20th. The step from Dec 20th is just one component of a larger upward wave (large step 3). That means when we finish this step, we should consolidate for a period of time and then move higher after the market has renewed its buying power. The only caveat would be that since we have achieved new highs above May 2011 (some indexes) and that satisfies the bare minimum for a third step since March 2009. It doesn’t seem likely that we would have a truncated third step but investment survival dictates that we always look at all sides of the situation. 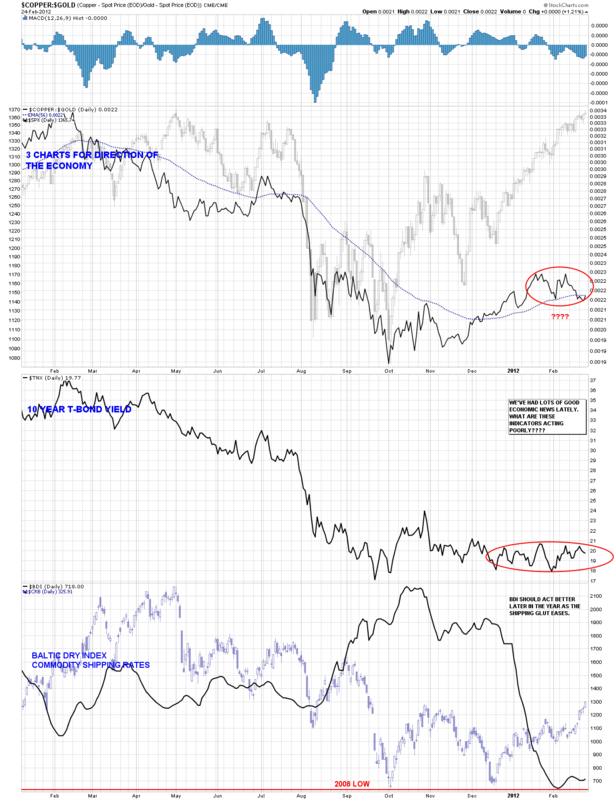 The following are some of the charts that show divergence and loss of momentum (MO). These charts are from MY CHART LINK. To find these charts, the chart number follows the date in the caption. SPX is staying next to its mid-line in the Andrew’s Pitchfork, but it hasn’t touched it’s outer envelope. Some indexes have hit (or exceeded) their outer envelope boundaries. That’s frequently a message that the market will correct or slow down. The Value Line Index was a very big leader beginning in March 2009 achieving significant new all-time highs beginning in 2010 and continuing through May 2011. Presently I find it troublesome that it can’t exceed its May 2011 peak. It lags well behind, while a few of the other indexes have broken through their May 2011 peaks. Is the economy really softening as portrayed in these charts, or are these indicators wrong? I guess we’ll have to wait a couple of months to find out. Due to its importance, this little chart is going to become a constant in my blog. The driving force of how the stock market arrives at a price is emotions and the primary of these emotions is “fear, hope and greed”. It’s difficult for people to understand this principle because it doesn’t seem logical. A comment I hear frequently is that the earnings of a company are still going up and the stock price MUST continue rising too. That “can” be true depending on a lot of factors but it might not stop the market from cutting the PE of your stock in half. Rising earnings and dividends were an ongoing theme throughout the 1973-1974 bear market. Normally earnings suffer at some point during a bear market, but 1974 was the exception. An over-priced market (remember the “Nifty 50” from 1972) plus an unstable political climate coupled with rising earnings came together in the perfect storm cutting the PE ratio of most stocks in half. 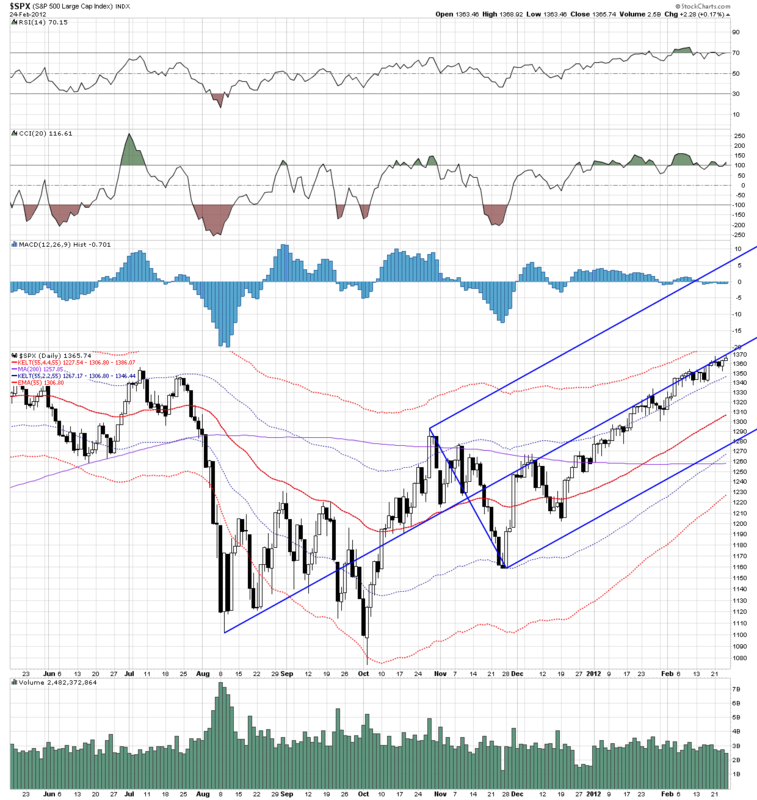 Mentioning the “Nifty 50” gives you some idea of the old fart that’s writing this blog. I can make it even worse by asking; Do you remember President Kennedy jawboning the steel industry over their price hike in 1961? There were consequences for those actions as President Kennedy was widely viewed as anti-business after the jawboning incident. Naturally the stock market didn’t like that and since it was already ripe for a correction, it willingly obliged. The market decline began in November 1961 (I think?). But I remember very well the climactic plunge in May 1962 when the Dow Industrials lost 35 points in one day. The Dow average was only 612 at the time and a lost of 35 points was huge. It was a 5.7% one day plunge. I thought the world was going to end as I had never seen anything similar (wait until October 1987). I was a naive kid at the time and now I’m not naive, just an old kid. Jeffrey Saut is Raymond James’ Chief Investment Strategist and a very savvy guy. He has been around the block a few times and he keeps meticulous notes. He has the market history written down and I rely on my memory (good thing long term memory is the last to go cuz I can’t remember why I left one room for another most of the time – ohhh look at the pretty bright shinny object . . . now why am I here???). Jeffrey and I seldom disagree except at the major turns. I may pull the trigger first at the peaks (Investment firms don’t like to sell) and it’s split on who may venture out of their cave at the concluding moments of a bear market. Raymond James link. 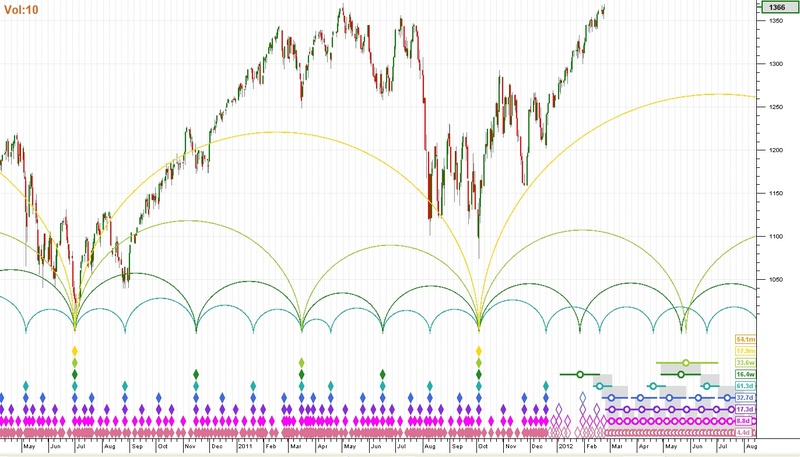 As for the stock market, last week the S&P 500 (SPX/1365.74) eclipsed its previous reaction high, recorded on April 29, 2011 of 1363.61, and now stands at its highest level since June 6, 2008. 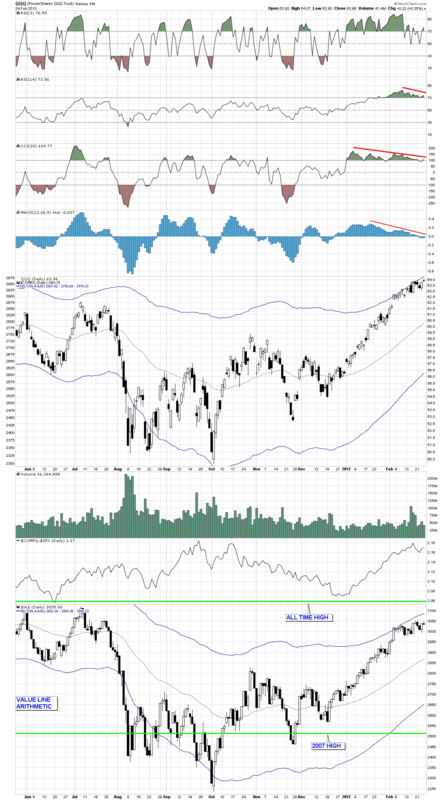 The closing high, however, came on very low volume and with numerous divergences. The two most egregious are the lack of upside confirmation from the D-J Transportation Average (TRAN/5139.14) and the Russell 2000 (RUT/826.92). While there are clearly other divergences like the non-confirmation from the Operating Company Only Advance/Decline Line, the fact that there have been no 90% Upside Days this year, the narrowing leadership, too many three-digit stocks, etc., the Trannies and the Russell are indeed the two most worrisome. That’s because the RUT is more than 5% below its one-year high, while the Transports are ~9% below their one-year high. Historically, when the S&P 500 was at a fresh 52-week high, but the Russell 2000 and the DJ Transports were more than 5% below their respective 52-week highs, stocks have been vulnerable. Therefore, if I am going to err it is going to be by being too cautious (not bearish), consistent with Ben Graham’s mantra – The essence of investment management is the management of risks not the management of returns. Good portfolio management begins (and ends) with this tenant. Does most of the above sound familiar??? He must be stealing his ideas from me because I wrote almost all of this blog on Sunday. I just haven’t figured out how he has hacked my computer. Actually we both have been sounding the same message for several weeks, so I guess it’s a coincidence. Jeffrey makes a good point that we might have nothing more than a sideways correction and to date, that’s the worst that we’ve experienced. Jeffrey will occasionally answer your emails. The following recording is referencing an email that I wrote a few weeks prior to Jeffrey’s verbal comments on December 6, 2005. I wrote Jeffrey about Bob Farrell and Edson Gould (two of my mentors) and the possibility of a multi-leg bear market similar to 1965-1974. Jeffrey as usual had the near term correct, but didn’t see the stock market tsunami coming. These comments were written after the 2000 to 2003 crash but 2 years prior to the October 2007 to March 2009 crash. Sorry about the quality of the recording but I was still using a PC in those days and didn’t have the nifty Apple software for recording directly from “line in”. I recorded this from the speakers and it sounds very hollow but you will be able to understand it OK. The recording is about 8 minutes long. Jeffrey answers my email first and then moves on to some comments about an excellent book “One Way Pockets”. It’s worth the listen. These are my personal charts and my playground for doodling trend lines, wave counts and other ideas. I draw the trend lines and wave counts on a daily basis (sometimes more often). You can find these doodles from 1 minute to monthly charts. I usually restrict my trend lines and wave counts to the first three charts on each page, TSX, DJI & COMPQ. The other charts on the page are usually for confirmation of the trend and wave structure. Pages 13 through 14 are shorter term indicators. The indicators are used to simply look for some type of leading action before a turn or confirming action of the wave count. Page 13 is a look-everyday indicator page. The other indicator pages are less frequently visited. Page 18 through 30 are sector ETFs. They represent most of the active sector ETFs and are always a good hunting ground when looking for something that is breaking in a new direction. Page 31 through 46 are growth stocks with indicators. These are stocks that have been in a lengthy uptrend. One qualification is that they must not be severely damaged in a bear market so they can’t rise to significant new highs in the following bull market. The growth stocks show daily market action for the last 1.5 years and weekly prices since 1992. This gives a good perspective of how they have behaved in the immediate past (daily charts) and how they behaved during good and bad times (weekly charts). My wave counts are not Elliott Wave! It’s different, simple and functions without a maze of exclusions. There are 3 peaks (or valleys) to a completed wave count. A reversal of trend takes place after a completed wave count. Often times it’s as simple as counting 3 bumps (or dips) on a chart . . . Other times, not so easy. In a downtrend the same rules apply except you are counting 3 dips instead of 3 bumps. 3 steps must stay confined to a channel. Laying a pen or pencil on the chart will help you visualize the channel. As the larger trend progresses, all of the steps that make up the trend will also be confined to a larger channel. Sometimes a channel is not clear until the surge phase (vertical move) has ended. When the market breaks its channel (regardless of the perceived wave count), the step has been terminated. (Make sure your channel was correctly drawn before calling a termination). Sometimes this may be your best indicator that a wave count is completed. The correction following the second step is larger than the correction that followed the first step, and obviously the correction following third step is larger than the second step correction. A single wave may sub-divide into another 3 waves. I will call this an extension. When this happens (1) the trend is still intact, (2) the channel will widened and (3) instead of a total of 3 steps, there will be 5 steps. Sometimes I will use the terms “step” and “wave” interchangeably. Reading the glossary helps in the understanding of this blog. There are many other important facts in the glossary. We have 3 possibilities for the future. 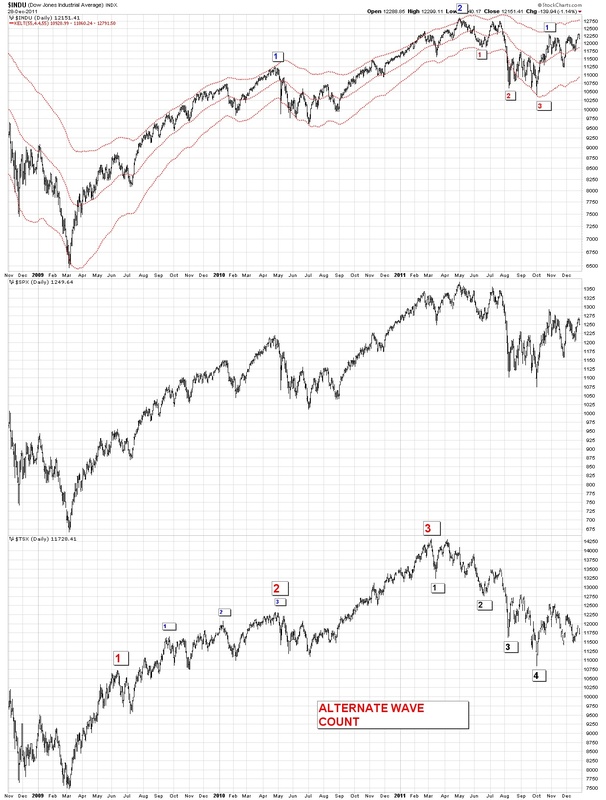 We have entered a very wide swinging market (megaphone formation) similar to that of 1965 to 1974. During that era we had three bear markets with two intervening bull market rallies. Each bear market had a lower low than the previous bear. The intervening bull market rallies saw new all time highs before the next bear market began. We also have formed a huge head and shoulders formation since 1998. If this formation is valid, the downside measurement calls for a bottom around Dow Jones Industrials 1,000. We began a long term bull market in March 2009. I favor the megaphone formation as the most likely scenario. Since 2000 we have had two bear markets, 2000 to 2003 and 2007 to 2009. Like 1966 to 1974, the recovery from the first bear market saw a new all time high (2007 peak). It’s possible that we may experience another all time high during the present recovery period. This would support the megaphone formation. 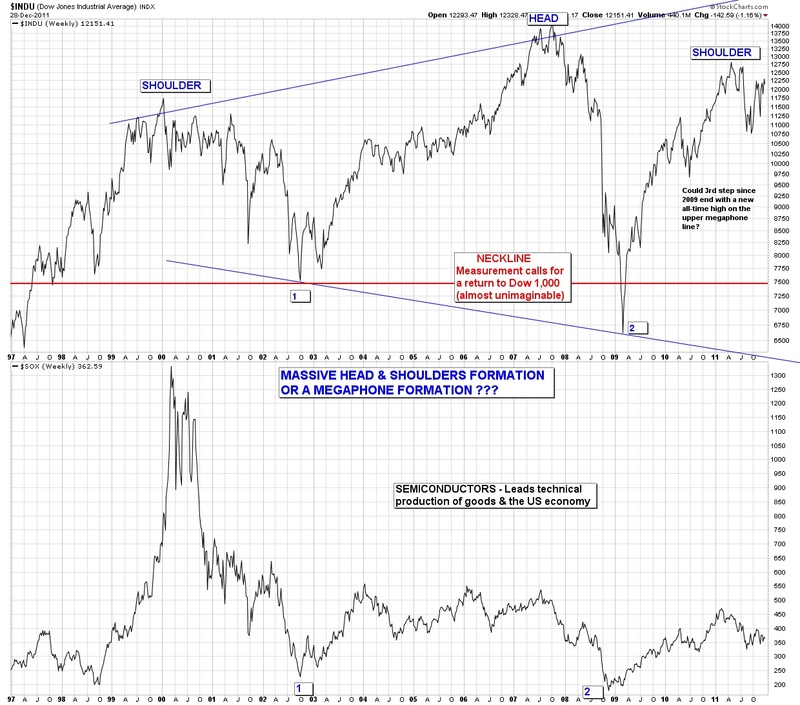 A failure to make new highs would support the head and shoulders argument. In both formations the conclusion of the present recovery would call for a third and final bear market. An estimated time for the conclusion of the final bear market is approximately 2018. 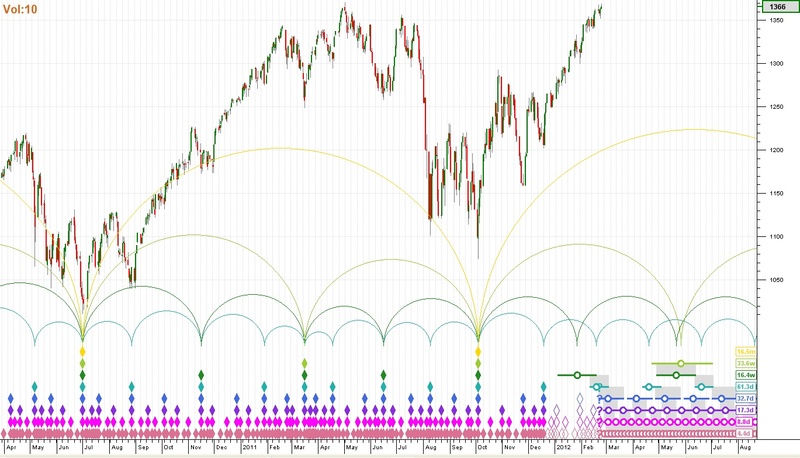 The lesser downside target of both formations is the megaphone formation as it likely calls for a bottom 1,000 to 2,000 points below the 2009 low, which would be around Dow 5,000. In the head and shoulders formation the measurement calls for a bottom around Dow Jones Industrials 1,000. This is almost an unimaginable event regarding the possible fundamentals to create this scenario. If this did happen, everything that could go wrong would have to go wrong. This scenario is so dark that it doesn’t seem possible but nevertheless, the head and shoulders formation is there and will be waiting until we pierce the all-time highs of October 2007. Remember these are simply possible scenarios and are not embedded in fact. Whatever the outcome, it never hurts to be a little cautious with some of your money. But in the worst case scenario, everything that we take for granted as being safe . . . . would not be safe. This is something to never forget in the event things go very badly. Hopefully we will never have to think about the worst case scenario. This very long term thinking is almost not practical for investment strategies. Following the long term strategy should be adequate. But one should always keep this scenario in mind whenever we are on the verge of a new bear market. If correct it could indicate how bad things could become. Edson Gould, Premier Stock Market Strategist – Edson Gould had a profound influence on the development of my techniques and indicators. Prior to me subscribing to his advisory service, I was just one of the crowd. After 40 years I still have many of the publications from his advisory service, “Findings & Forecasts”. Fearing the loss of these hard copy reports I have recently scanned and created pdf files of these reports. Now I have hard copies and computerized versions of the reports. My series #1 indicator was mentioned by Gould only once in his market letters. If you didn’t catch its importance, too bad, because he only gave you a peek. I believe that he used this tool extensively and never told the world it’s importance. Prior to Gould writing about this indicator I had been looking for one that had similar characteristics without success. Thus when Gould wrote about it, I recognized instantly that I had struck gold. I have modified this indicator slightly and researched it back to 1939 for the Industrials, Transportations and Utilities . This was a lot of work as it was before computers and online data (remember when Barrons was available only on paper, still is for the distant past). Edson Gould was truly a legend in his own time. It’s too bad that today many people have forgotten or never heard of him or his discoveries. Below you will find only the first page of these reports. A teaser is what you might call it. The rest of the reports are available upon request. This is a man that deserves to be remembered throughout technical analysis market history. The following are links to Edson Gould reports. It was also my most important discovery, for it explained the irrational volatility of markets that had mystified me in my early years. During those early years I found nothing worked in predicting these irrational market swings. But the fog lifted after reading this report and I began to understand how to begin predicting the market. The book “Extraordinary Popular Delusions and the Madness of Crowds” is very useful in explaining crowd behavior. With companies failing to pay dividends commensurate with their earnings, this indicator has failed. As the market deteriorate in the coming years, I would expect dividends to return to their former levels and this indicator will once again become useful. Prior to the late 1990s, it had 100 years of success. This was written and directed at the upcoming bottom in 1974 but it applies to all major bottoms. Where do you think my three steps principle came from? Straight from this report although I modified the concept through the years. Gould’s 1974 forecast kept me bearish and short throughout 1974 until the week before Christmas 1974, during which I began making long term purchases. After that it was ride the bull phases that transpired from 1975 to 1982. 1982 to 2000 was the greatest bull market of all time. This was a remarkable forecast in 1977, where the Dow Industrials had never been higher than 1,000. NO ONE had predicted a rise of this magnitude in 1977. Most were waiting for a resumption of the bear market. As part of the 1977 to 1982 forecast I have the following story. On Wednesday August 4, 1982 I went long the market for the first time in months. By Friday, August 6 I was worried that I had made a mistake as I was deep in the red (I was long the Kansas City Stock Market Contracts). The Kansas City Stock Market Contract was the first of the stock index contracts (February 1982). It was based on the Value Line Arithmetic Index, margin requirement were quite low, and it had a multiplier of 100 times the Value Line Arithmetic Index, which meant the leverage was very high. On Friday (Aug 6), my wife and I went to dinner and I told her my tale of woe and asked her whether I should sell my long positions. I explained that my series #1 indicator had reversed and continued higher on Thursday and Friday but the market had continued lower. 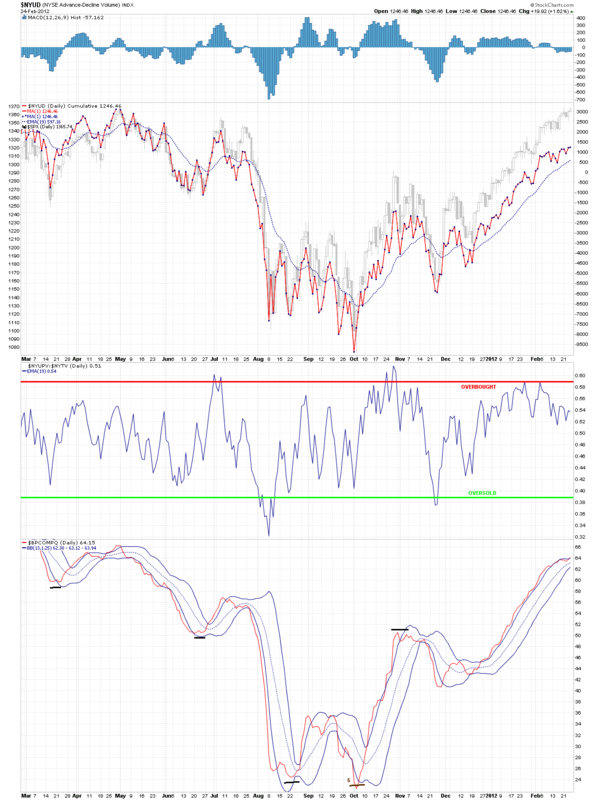 Since the key indicator was usually correct, we decided to stick it out awhile longer (I was crazy in those days). On Monday August 9, 1982 the market took off like a rocket and never looked back. The ignition for the 1982 to 2000 bull market was underway. I skyrocketed out of the red and had a big profit. In August 1982 the only people that were bullish were Edson Gould, Robert Prechter and myself (probably a couple of others but I didn’t know them). Everyone else was extremely bearish. It was a perfect example of extreme crowd behavior. All actionable signals are only for short term time frames. These signals are not designed for intermediate or long term time frames BUT . . . . .
After a short term buy signal, long term tax status can be achieved by a continuation of the upward trend, which causes short term actions to morph into long term holdings. See more details in the glossary under “Taxes, Futures Contracts” and “Money Management”. In this blog a warning of an impending bottom (or top) is often issued well in advance of the formal buy or sell date. This allows thoughtful consideration prior to a formal action signal. To get a sense of how this works, you should read the days prior to a formal buy/sell signal. I often buy/sell in my personal account based on the early warnings. The transaction record near stock market bottoms will show that I am very skittish and usually remain so until the new direction is well underway. This blog was suspended the first time on 9/17/11 due to a death accompanied by a family illness. It was suspended a second and longer time on 9/27/11 due to an extremely serious family illness. Blog resumption with comments and charts began again on 11/27/11. Unfortunately due to illness I clearly missed issuing a formal & important buy signal closer to the 10/4/11 bottom. Hopefully this error will not be repeated. There are useful items throughout this blog. For instance, the “Wall Street Quotes” can be very instructive. So make sure and look all through the blog.